Leaving Kil So Quan, the climb back up to the main road got our blood circulating fast! It was already quite warm as we turned east to head out around the State Park and across the Wabash River. Just below the river we turned west again towards the Salamonie River State Forest. 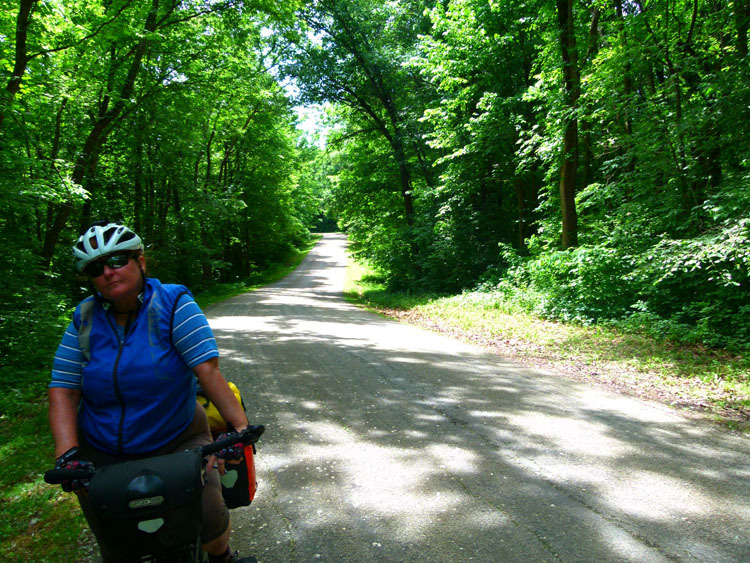 We entered the forest via the Salamonie Dam, it was the first time for a while our views weren’t of corn fields. Seeing a shaded viewpoint, we took the opportunity of resting and taking in the view. There was nothing for sale at the visitor’s centre, so we just drank our water and ate a muesli bar each. As we rode over the dam wall we could see the extent of the State Forest, it was our first real experience of forest since arriving here. Once across, we turned down and under the shady canopy. It was a nice relief from the sun, but the road was continuing down at every twist and turn – not a good sign! Towards the bottom of the decent Shazz’s chain jumped off. She called out and was lucky to get my attention as I was beginning to make my way uphill and around a bend. I went back down and soon got her going again. We had stopped at a pull-in for a walking trail, one of many in the area. Thankfully, the climb back out of the State Park was a little easier as the climbs were longer, but less steep. The ACA route had us heading north, but from here it was a long way to any place to stay along the route. We decided to head to the city of Wabash instead. Shazz had contacted the Knight’s Inn and secured a room for the night, all we had to do was cycle west on Baumbauer road. It looked pretty easy on Google Maps, but we were about to get some training in for the Rockies as we navigated our way along this rollercoaster of a road. It didn’t end there either, as we got to town we turned left onto a long, long hill up to the hotel. The heat and the hills had taken a toll on our bodies, so instead of going straight to the hotel, we decided to sit and have a drink and refresh ourselves at Penguin Point a local “greasy spoon” restaurant specialising in all the usual fare. The restaurant at the Knight’s Inn was pretty ordinary, but we were hungry and didn’t fancy eating hamburgers or pizza again. We spent the evening researching our next stop, probably Fletcher Lake, although there’s not much info on it. We are also out of camping gas, but have found a Walmart which is on our way out of town tomorrow. In the morning we were awakened to the now familiar sound of the lawn being mowed, right outside our window! It was 7 am and time to get up anyway. We made a coffee in the room, got packed and rolled back down the hill and across the Wabash River. It was all uphill from there to get out of town and across the river valley. Once we crested the hill the road became much wider and so did the footpaths. We elected to go onto the footpath and out of the traffic, crossing the highway and finding Walmart and our new gas canister. It was hot again today with a southerly wind that didn’t bother us. Once again we crisscrossed our way through field after field of corn and soybeans. The small but quiet country roads led us to the shady little town of Denver where we sat and had lunch in the Hoosier Hot Spot, a small diner that used to be the bank. Denver is so small it doesn’t even have a bar, and most of the businesses of the once thriving little town are closed and barred up. This is becoming a theme in most small towns we pass through. They’ve obviously past their prime and fallen on hard times. Small businesses like the grocer, general store or local bar have succumbed to the big megamarts built in nearby larger towns. People now have to drive to the next big town and do a weekly shop and drink at home. Thankfully, this little diner/cafe is holding on and the locals are supporting it for lunch at least. The clientele are all from surrounding farms or are now retired and spend a part of their day with friends chatting and telling tall stories and discussing the news or the grain prices. This is also a common theme we have observed in almost every place we’ve stayed. 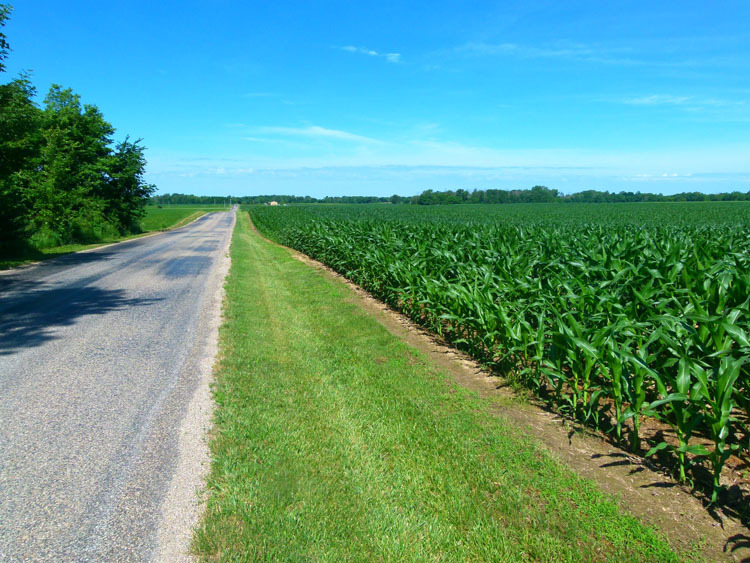 There’s no escaping the sun in the cornfields! After lunch, we went up the street to Hagans Bestmart, a small general store to buy something for dinner. 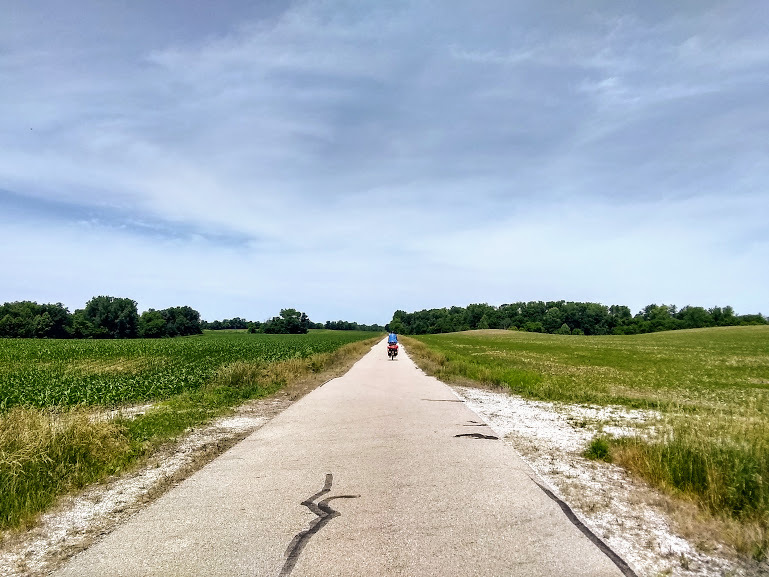 A couple of blocks down, we picked up the Nickel Plate Trail, a new rail to trail that only ran for about 3 miles, but was covered with trees and kept us out of the sun for a while at least. 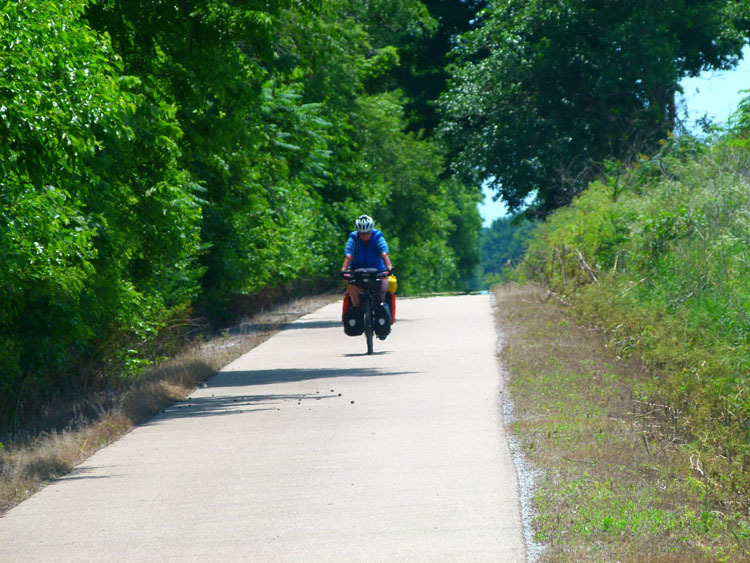 We enjoyed the short, shady ride up until Deedsville and once again turned west and headed back through farmland and across highway 31 and onto Fletcher. The campground here is just half a dozen permanent trailers parked up beside the small lake. There are only about 10 houses and everything is nestled around one end of it. The trailer owners, who come from nearby Logansport, all have a small jetty where they keep their pontoon boats. 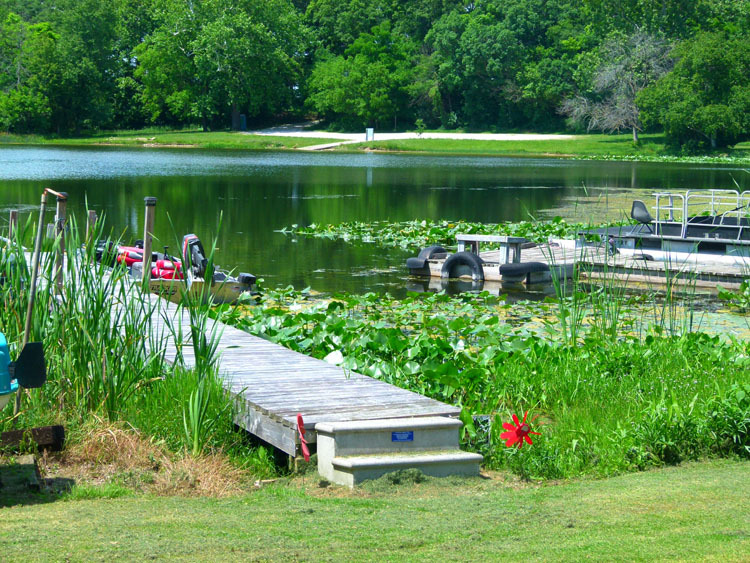 The lake is stocked with small fish and a popular spot in the summer. The lady across the road looks after camping and she took our $11 and showed us where to go. 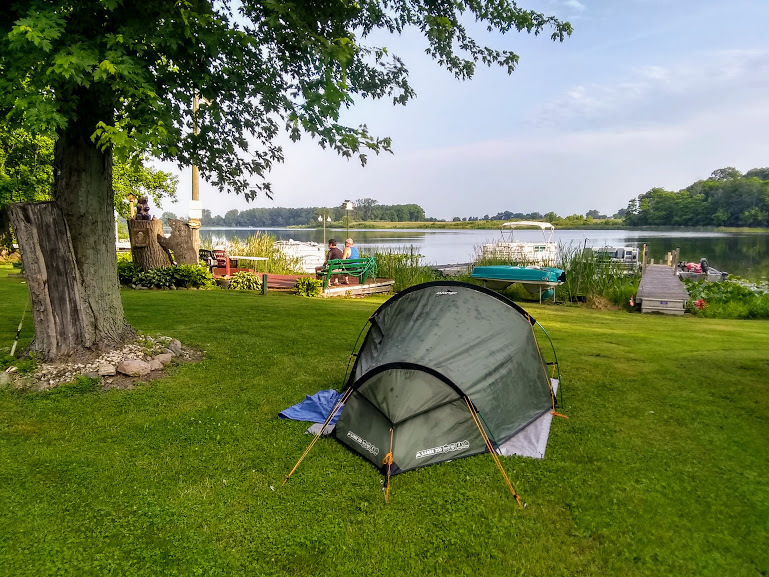 We pitched the tent under a tree on the grass near the water’s edge. It was an idyllic little spot and I could see why the locals love to come here. 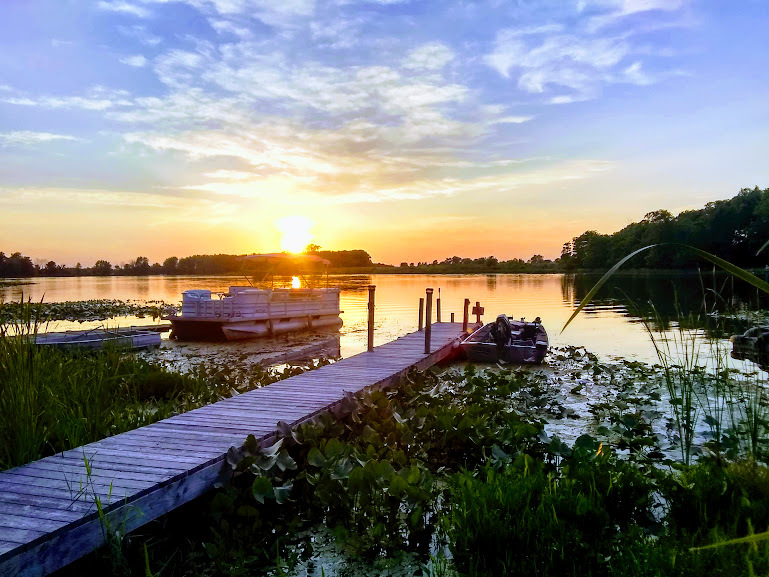 In the evening, some of the trailer owners showed up and got in their pontoon boats and cruised round and round the lake until it went dark. 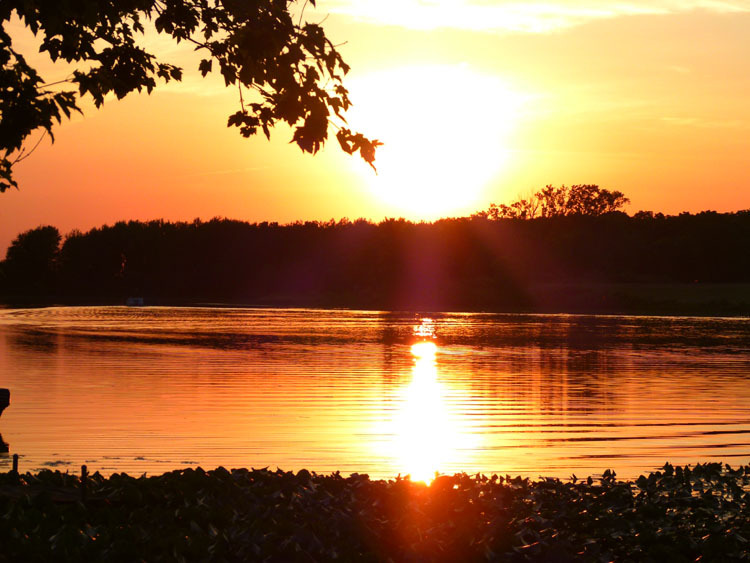 The sunset was a treat and reflected itself on the lake like a mirror. It didn’t take long to clear the lake and get back amongst the cornfields. We rolled down the 16/119 and into another Buffalo, a much smaller cousin to the one in New York State. It was still pretty hot and we found a park bench opposite the Stop & Shop general store. We took our time eating lunch, cooling off and rehydrating. Cold Ice Tea is our preferred lunch drink. We’ve also found that if we buy something and ask nicely, the shops usually let us fill our water bottles with ice and fresh, cool water. As we have 6 bottles between us, we think that’s a pretty nice thing to do. Having cooled off and refuelled ourselves, we headed out onto Main Street and across the bridge over the Tippecanoe River. Almost immediately, I could feel the bike beginning to fish-tail a little bit. I pulled up on the middle of the bridge, I had punctured the rear tyre – it’s always the rear one, the hardest to change! We walked the bikes across the rest of the bridge and down the street a little trying to find a shady spot to change the tyre. It didn’t take too long and we found an unfenced lawn where we could unload the bike and work on it. Somehow, I hadn’t just punctured the tyre, I had blown out the side wall, which I thought was rather odd for a Schwalbe Marathon Plus with only about 3000kms on it. With the tyre off, I checked it for what had caused the blowout. Inside it, I had put a plastic, Teflon strip given to us back on the side of the road in Australia by a kind passer-by. The strip is an extra layer of protection against punctures, even though the tyre has its own layer. It had become brittle and completely crumbled, taking out the tyre wall with it. There was no other choice but to put our brand new spare on and throw this old one away. It took us about 30 minutes before we were on our way again. 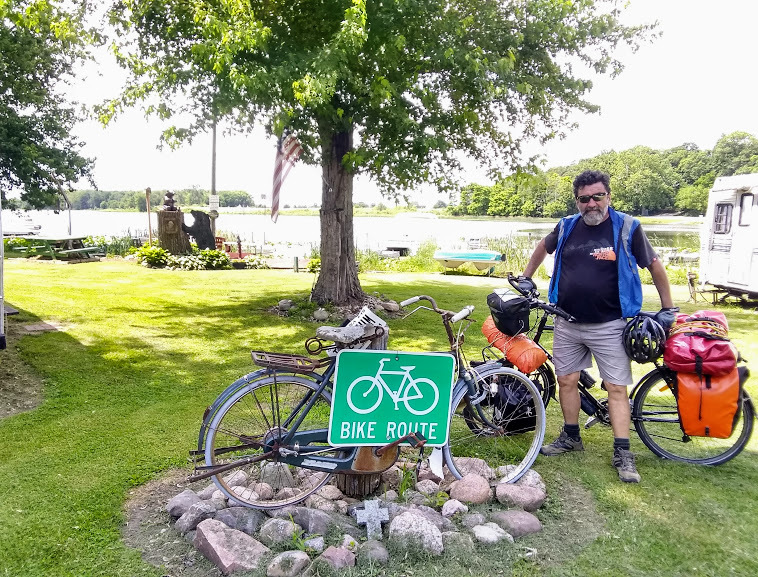 We rode out of Buffalo and across State Road 39. We got about 3 or 4kms out when I realised my bridge wasn’t sitting in my mouth. I pulled over under a tree and started unloading my bike, explaining to Shazz what had happened. My bridge had been put in by a dentist about 10 years ago and would never stick in place. I’ve had it re-stuck about 4 times now and it always comes loose about 3 weeks later. The problem is, I can’t just leave it out as the opposing teeth will begin to grow down without any opposite pressure on them. This would mean a trip to an Orthodontist here in the States, which would cause us to lose a lot of time and money! It would basically end our trip. If Shazz thought I seemed a bit scared, she was right! The trouble was, I couldn’t remember taking it out. My best bet was it was at the park bench back in Buffalo. I just had to hope it hadn’t fallen in the uncut grass or in the rubbish bin when we were tidying up after lunch, I’d never find it. Worse still, a crow could have picked it up, it’s gold and shiny! All this was going through my head as I sprinted back on the bike. I passed the place we had changed the tyre. “Please let it not be there”, I said to myself. I got back to the small park and walked over to the bench. To my utter relief, there it was sitting precariously on the edge of the gap between planks on top of the wooden table. I took a deep breath. It must have fallen off the wrapper paper when we tidied up and somehow landed back on the table top. Karma was smiling upon me today! Maybe our good deed back in Westfield, where we found the money, had come back to repay us. As we always say, “What goes around, comes around”. I hurriedly placed it back in my mouth and raced back to Shazz and told her the good news, she was just as relieved as me. We headed back out on the road. There wasn’t far to go. We were staying at the Dream Acres Campground about halfway between Buffalo and Monon. It was a hot, still night, punctuated with the loud screams of young children let run wild. Add to that and the fact that there were no beers, you’d have to say it wasn’t our favourite place. Especially after the campground manager promised to bring me over a few and didn’t, I was pretty dark on him! !